“Wish you were here”, (-Ike!) Artist, unknown, but probably the coi guy. . .
Here’s hoping the stars align and Ike’s Place is able to return to 16th; he’s applied for the permits to reopen his sandwich shop in the space that used to house Joseph Schmidt Chocolates, just off the corner with Sanchez Street. SF Eater reporting that Ike’s Place Sandwiches just might be coming back to the Castro to a storefront of its very own, having been evicted from the old 16th Street location, a few months ago. A few details need to be sorted out before it’s a done deal, we’ll keep you posted. Kudos to him for staying true to his roots and relocating a block from the old spot. Sure, he’s serving up sandwiches from Lime at the moment, but the guy definitely needs his own space. 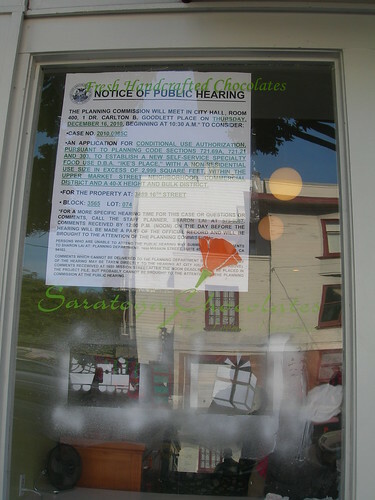 If all goes to plan, he’ll be taking the storefront that used to house Joseph Schmidt Chocolates (purveyor of the best chocolate in the area, and it was a darn shame to see them go, too) The address is: 3489 16th Street, near Sanchez, and it’s right next to the fabulous restaurant Tangerine. Thanks Ike! I drove by Ike’s Place on my way home from work yesterday, to bid Ike farewell. Owner Ike Shehadah had announced early that morning that this would be the last day of operation in the Castro, closing the only San Francisco location of this phenomenon of a sandwich shop, and the inaugural store. The queue for the last Ike’s sandwich stretched nearly to the end of a very long block, even at 8.30pm. The crowd was doing front to back waves to pass the time. Shehadeh lamented to EATERSF that a handful of neighbors had pushed-out not only his business but the 47 people he employed. And I think he’s right. He’s a superstar in a neighborhood that has always supported local entrepreneurs and business while trying to minimize the presence of big, national retail chains. Ike succeeded in drawing national attention (and tourists) to the Castro for his unique and wonderful food. Sure, maybe this store front wasn’t ideal, but there are so many available spots within blocks, I wish he would’ve relocated locally. These days the Castro has a lot of empty storefronts due in part to this slumping economy, so if the neighborhood purports to favor local business to national chains, why is it that Ike has failed to find another location right here for his shop? The neighborhood should reflect on that and when they find an answer, maybe the Castro will become more friendly to other local entrepreneurs, too. ikes’ place is. . . back? NEAT! EaterSF reports that Ike’s Place will remain open after all. Following up on my previous post, Ike’s was to be evicted today and in a stunning 11th hour move, . . . wasn’t ! How cool would it have been to have been there when Ike came out of the store and exclaimed, “we’re not closing!” Seems there was a technicality in how the paperwork was drawn up and the whole case was thrown out. Man, those neighbors that instigated this whole thing must be in a snit!! Today Ike announced that this will be his LAST day, and he’s staying open late to celebrate. I drove by on my way home from work and the line stretched nearly to the end of the block. People were doing spontaneous ‘waves’ to pass the time. We’ll miss you Ike! I hope you open another location here in San Francisco! 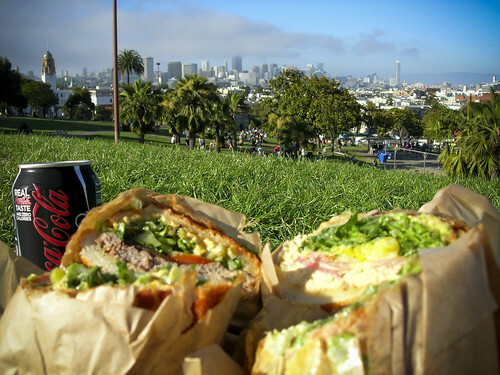 San Francisco Chronicle broke the news this morning that Ike’s Place Sandwiches has been given an eviction notice after a lengthy legal battle. 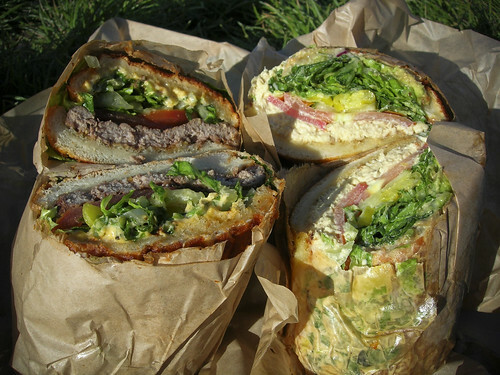 This is my favorite sandwich destination in San Francisco and I’m not alone. In just a little over two short years of business, Ike’s has managed to achieve national recognition, which you wouldn’t think would be all that easy to achieve when your dealing with a food so ubiquitous in the American diet as the sandwich. He’s made one that is that good. Rolls are fresh-baked at the time of the order, meats are prepped on the premises, and a special sauce of mayo, garlic and around twenty other secret ingredients is baked right into the roll. A foodie culture has risen around Ike’s and the line is always present outside that shop (tip, avoid it by calling ahead;-). Of course, that also contributed to the problem, despite Ike’s efforts to accommodate the litigious neighbors who, by many accounts, were uncompromising and mean. Ike’s was a positive force for the neighborhood. The Castro prides itself on fostering small local business to the exclusion (for the most part) of national chains. We actively preserve and maintain that quality of life, the unique character of the neighborhood in which we live, by keeping them out. But times are tough, rents are high (too high) and it’s hard for all those businesses to remain open. There are more and more empty store fronts and the neighborhood has to work to make opening a business viable again. 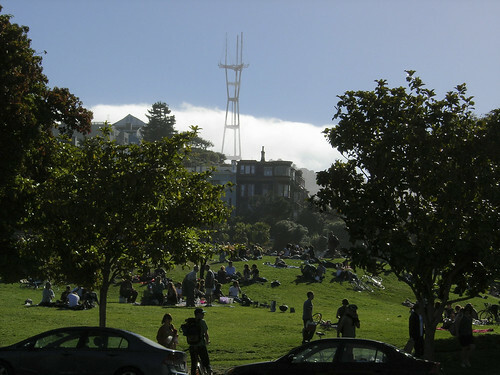 In this playing field, Ike’s was not only a success story but a magnet for the neighborhood, drawing customers not only from other parts of the city to the Castro but, thanks to national media publicity, he made the neighborhood not only a gay tourist destination but also a sort of foodie tourist destination. Ike’s personality was also a great fit, reflecting the easy going and friendly nature of the community. As popular as his business got, I often saw him still working the line himself, always smiling and concerned about the customer experience and quality of the food. All the more sad that he’s going to have to close his doors by August 26th. MUS•e•YUM only hopes Ike’s will find another location in the city and in the Castro, especially. We need our Ike’s! 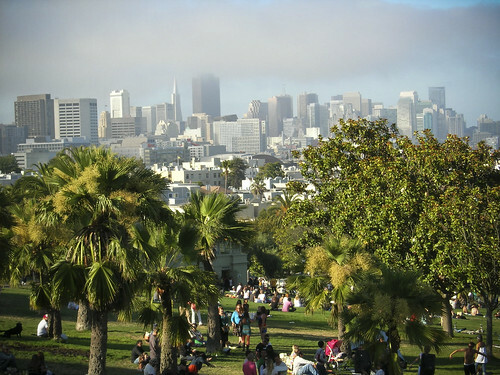 the best sandwiches, the best ice cream and the best park, all within two blocks of home! On a day like today I can’t think of a better place in the world to live than the Castro. Our evening plans having been cancelled, L. and I made an impromptu plan- a picnic! We took a short walk down the hill and bought sandwiches at Ike’s Place on 16th at Sanchez Street. Ike’s is one of the best sandwich companies in the country (it’s the “Dirty Sauce”) and I’m so glad he’s got the press exposure to back it up, not only because the food is so excellent but also because the owner, Ike Shehadah, happens to be such a great guy. Check out his story on Food Network. Sandwiches in hand, we continued walking right to Dolores Park, which is two blocks down the street from our place. Even at 6pm there was a party atmosphere there, some ravers having set up a sound system pumping out house music to dancers and hoola hoopers alike, with lots of folks just lying in the grass enjoying the sight of the fog rolling in just above the panoramic view of the San Francisco skyline, the clouds just barely obscuring the tip of the TransAmerica building. When we finished our sandwiches we decided to make one last stop. At the corner of Dolores Park happens to be one of the best ice cream parlors in the country, Bi-Rite Creamery. There’s always a line but it is so worth it. 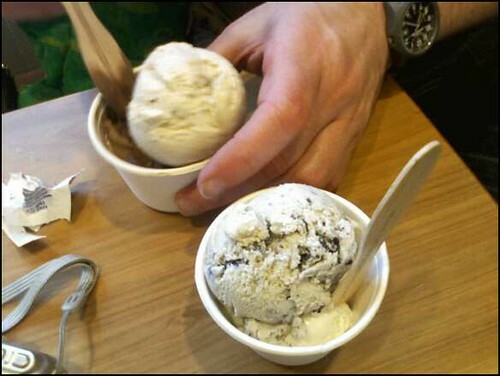 Tonight, I went for a scoop of brown butter pecan atop a scoop of cookies and creme. 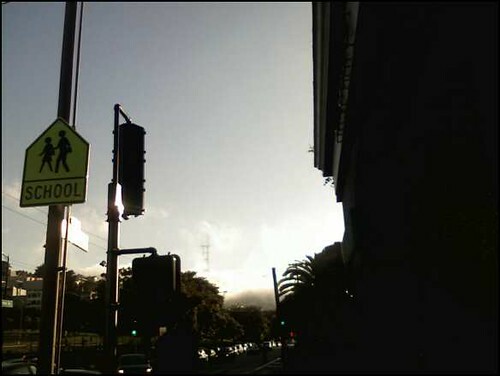 The walk home afforded the spectacle of the fog blowing in over Twin Peaks and spilling into the Castro, backlit by the sun. Whisps of white curled around Sutro Tower and vanished into the blue above. Unbelievable how beautiful that is.